For most Darryl Way needs no introduction. A classically trained violinist, he was one of the founders of Curved Air, the seminal UK progressive rock band that led the first generation in the genre. 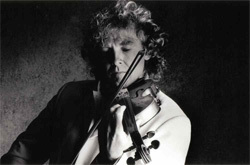 His resume to date is lengthy, having been involved in everything from rock to prog, classical to opera. Darryl Way: with instrument of choice. With his current solo album, Children of the Cosmos, Way returns to his roots, classic melodic progressive rock as, in his words, he tries 'to recreate the spirit of experimentation that led to the �Progressive Rock� movement of the late 60s and early 70s.' I suppose their is some experimentation going here for him, especially if he hasn't be working in this genre as of late. Yet there's nothing greatly technical about the album. It's largely airy and atmospheric keyboards and Way's wistful, mostly gentle. violin, supported by a subtle rock groove. If anything it's like easy listening prog, or a gentler Jean-Luc Ponty without the acidic leads ripping of the horsehair in so many strands. Although Way can get frisky as with his lead in the last of Summer of Love. I suppose it will remind some of his early work with Curved Air. Excepting the predominance of his violin, this album runs in the same spirit at Curved Air's newest album North Star. But there are some stand out tracks here. One is pop melodic rock of Don't Look Back which grafts in the famous Pachelbel's Canon. Another is Fire With Fire, featuring a female vocalist with a single name, Rosie, but the voice of angel. The music of the song is average symphonic rock, so the vocals basically care the song, not vice versa. Later in the album there are three songs all called 'tales': A Winter's Tale, An Modern Tale, and An American Tale, not sure if this is intended as a trilogy with a singular theme or not. But this points to another. Curious by it's absence, Way offers meager liner notes including no information of those who participated, if there were any, and no lyrics to speak of. Mostly, as said earlier, Children of the Cosmos is quiet, gentle, and reflective melodic rock, nearly unassuming, yet somewhat self-absorbed. I don't know if I would want to listen to it over a bottle of wine as I'd likely drift off in sleep. 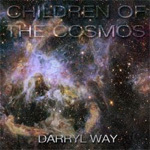 Darryl Way's Children of the Cosmos is quiet, gentle, and reflective melodic rock, nearly unassuming, yet somewhat self-absorbed. It's like easy listening prog rock.